How can the Average Session Duration be less than the Average Time on Page? In Google Analytics, seeing the time spent on your website or on individual pages is not as obvious as it first appears. This Misunderstood Metrics article explores the concept of time in Google Analytics…or lost time as the case may be. Google Analytics presents a lot of metrics and most people make assumptions on what they mean based on their names. Google Analytics Time on Page and Google Analytics Session Duration are typical examples, until you discover one not-so-obvious fact: Google can’t measure the time a user spent looking at the last page of their visit to your site. This happens because Google uses the time of the next page view to determine the time you spent looking at the current page. On the last page, there is no next page recorded, so the Time on Page is unknown (recorded as 0) and the Session Duration ends when they opened the last page. 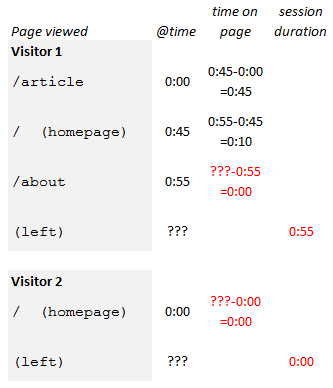 For sessions where the user only looked at one page (a “bounce”), as in the Visitor 2 example above, the Time on Page and the Session Duration is 0. This isn’t because Google knows they left right away — it is because they have no idea of when the user left so they couldn’t calculate the Time on Page, and they consider the lack of a value means 0. It could have been 10 seconds or 10 minutes; they don’t know, so they say 0. Did the user read your web page? They don’t know. Maybe. Maybe not. All we know is that they didn’t look at another page on your site within the next 30 minutes (that’s how long a default session lasts). Can you assume they left without reading the page? No. There are some techniques (read Measuring Time On Bounce Page) you can use to see if people are actually reading your pages, even if they bounce. For example, a particular landing page with a high bounce rate like this one (87%), I discovered that 75% of users were still reading the page after 60 seconds; 43% were still reading after 5 minutes! These “bounces” were highly engaged with the content on the page! But 87% of them had a session duration of 0. If a page does not have a high exit rate (% Exits), then the Avg Time on Page is a pretty good reflection of the real average. With a higher exit rate, you should have less confidence in the average metric because the average is based on only the portion of total users that went on to visit another page. 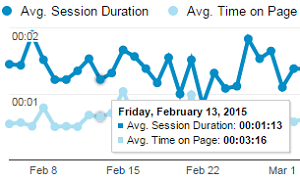 The Session Duration metric does not have the same capability to ignore the effect of exit pages. Every session has an exit page, and if there aren’t many pages in the visit, the loss of that last page timing can have a massive impact on the total. In the extreme case of a “bounce” visit that has only one page viewed, the Sessions count is 1 but the Session Duration is 0! This simple calculation is heavily influenced by the lack of timing on the exit pages, especially for sites with low Pages / Session values. For this reason, using Avg Session Duration as a key performance indicator is not recommended as fluctuations in the number of pages viewed per session, the number of bounces, and the number of sessions can all influence the metric. If you have a high Bounce Rate, the Avg Session Duration will drop significantly — even lower than the Avg Time on Page! This confuses a lot of people — the Avg Time on Page calculation removes the effect of Bounces (Exits), but the Avg Session Duration calculation includes the Session count for those Bounces which reduces the average. If you track events in your webpages, Google’s calculation of Session Duration gets a little different; the end of the session will shift to the last interaction hit. This means if you track things like file downloads with events, and if a visitor downloads a file at the end of the last page, then the session duration is calculated to the time of that event (note: This does not happen if the event is a non-interaction type). The overall effect is to alter Session Duration for sessions with exits on pages where events occurred — something you can’t always predict. Unless you can trigger the event on all exit pages, this actually makes the measurement less consistent and therefore less useful as a key performance metric. 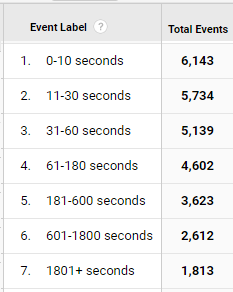 The Google Analytics metrics for Avg Time on Page are a good indication of the time users spent looking at a page on your site if the page has a low % Exit. Do not use the Avg Session Duration as a key performance indicator as it is heavily influenced by Pages / Session, Bounce Rate and Sessions count. See how Google Analytics measures the time on your own website pages. Verify that the Time on Page is only recorded for pages that are not the exit page. There is a free add-in for Microsoft Excel that can download your Google Analytics data; no credit card required. Look for groupings of the values in City+Service Provider+Session Duration+Count of Sessions — rows with the same values in each of these columns are most likely part of a single ‘session’, or a single user’s website visit. Each page visited will be shown in separate rows. The first page is identified as an ‘entrance’ and the last page of the session is an ‘exit’.